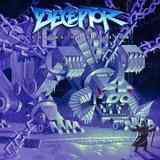 It may be understandable why Chains of Delusion quick EP by a relatively unknown UK entity Deceptor may be easy to miss. Understandable, but if you call yourself a lover of old traditional metal, NWOBHM, thrash, or all of those things combined, it will be inexcusable, and you will regret not hearing it. Deceptor charm specifically lies in the aforementioned style mixture, which they were able to digest, regurgitate and spit out, as if they have taken a time machine to the early-mid 80s. Yet at the same time, if Deceptor were to resurface in those days, they would still have enough original edge to be called a unique band, something which is a lot more of a compliment these days. The main riff of To Know Infinity is a prime example of the band’s statement. As if saying “we came up with this gem, so now we are going to squeeze it for all its worth”, Deceptor plays and toys with this concoction throughout, even in the solos, seamlessly connecting verses and chorus. Weaving in and out of melody loops, the song has an excellent flow, is immediately memorable, and definitely reminded me of The Lord Weird Slough Feg (back in the days when they bore this full name) circa Traveller. Space/time travel is actually probably a topic on Chains of Delusion, given that its fabric is stitched together by a pair of very short robotic voice instrumentals. Those instrumentals used for a quick montage, nothing else, the strength of the EP is in its impeccable songwriting, which sounds so painfully familiar, but you would not be able to say “I have heard it all before”. It is because Deceptor glides between metal styles not settling into any grooves, almost sounding romantic on the choir of Sentient Shakles, and then gaining rougher edge on Heatseeker, at times uncorking very speedy thrash when their horsing around seems to have lost the reins. The genuine nature and the utmost playfulness of this music, however, are remarkable and will bribe the listener without a doubt. Adding another oddball dimension to the music is the vocal multiplicity presented on Chains of Delusion. It is perhaps because Deceptor uses two vocalists, both bassist Paul Fulda and guitarist Sam Mackertich are given singing credits, that the band can have the range between Skalzi-like rough edged singing, gang choruses, occasional demented shriek and even a growl or two. When the final chords of most epic sounding Walking Dust closed, it felt that the experience was too short. If you own every piece by Slough Feg and/or Dawnbringer in your collection, then you absolutely must seek this little quirkle.